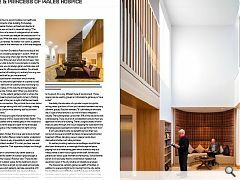 One of the most coveted sites in Glasgow now boasts one of its most innovative buildings with completion of a new palliative care centre by the Prince and Princess of Wales hospice. Urban Realm checked in to see how hospice responds to a sensitive setting and complex brief to deliver choice and dignity to patients. The Prince & Princess of Wales Hospice has marked a milestone moment with the fulfillment of a long-held ambition to migrate to a purpose-built care hub in the grounds of Bellahouston Park, Glasgow. The Arnold Clark Building marks the culmination of a mammoth eight year £21m fundraising drive to deliver accommodation for 1,200 patients and their families within a parkland setting gifted by Glasgow City Council. Belying its size the hospice partially burrows into the hillside to manage the scale of four interlinked ‘villas’ within the wider landscape by reading as a three storey structure from one side only. In doing so the hospice has left behind its historic home at Carlton Place in the city centre, but its front door hasn’t yet been slammed shut. 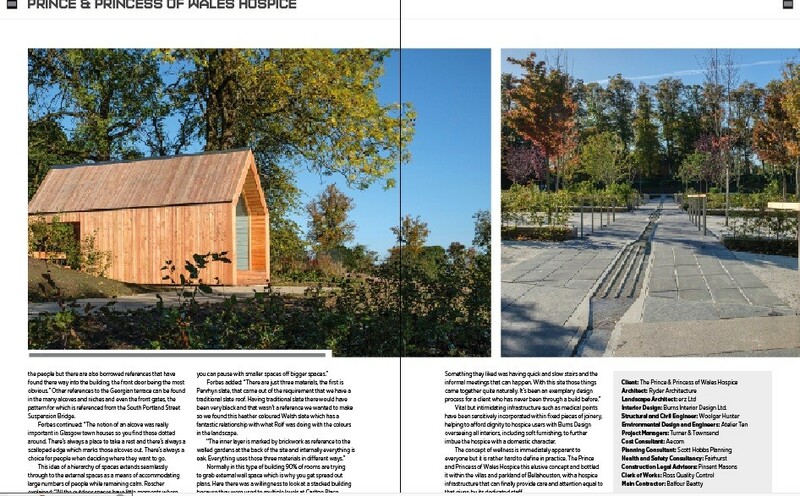 Instead it has been transported to Bellahouston Park to serve as an extension of the hospices roots. Ryder Architecture and ERZ formed the core of the design team the building and grounds cater for patients as young as 16, providing palliative care and a supportive environment for them and their families, a brief which presented a number of challenges not least how to accommodate civic healthcare services within a domestic-style building. 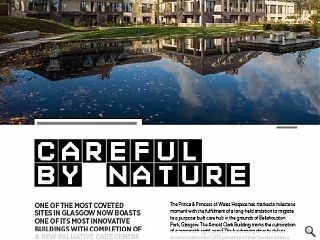 Fortunately, project architect Alastair Forbes, architectural director at Ryder Architecture, was on hand to reveal all, saying: “The building takes the form of a series of cottages which sit under idiosyncratic roofs but when you analyse the cross section it’s a house within a house. What that does is create a stepped edge which is essentially a veranda. No matter how cold it is patients will want to be outside on the veranda a lot of the time wrapped in blankets. Seeking inspiration Forbes’ first move was to book himself in for a short stay at Carlton Place in order to better understand the reality patients face in a way impossible to read from a plan or drawing. The architect recalled: “It’s what you hear, see and smell from that perspective. That experience helped me through the process. 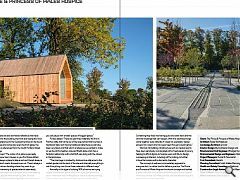 In switching from a constrained city centre base to a parkland setting has the wealth of outdoor space brought a new dimension to the hospice? Roscher said: “There are lots of different types of outdoor space. All the bedrooms are on the ground floor and they’ve all got an individual semi-private garden terrace space which patients can take ownership of. It opens out to the larger landscape to give views and space. It isn’t just patients who are benefitting from their new surrounds however and staff are happy to leave behind barred basement offices, dangling vacuum cleaner cords down stairwells and other such idiosyncrasies. As well as providing welcome camouflage a small hill has also been developed as a meaningful landscape set piece, playing host to a meandering path which snakes its way to a hilltop shelter, a semi-indoor space where staff, families and patients can take a quiet moment to themselves. Still somewhat barren it will soon play host to a wild flower meadow but expansive views of the city skyline can already be enjoyed. 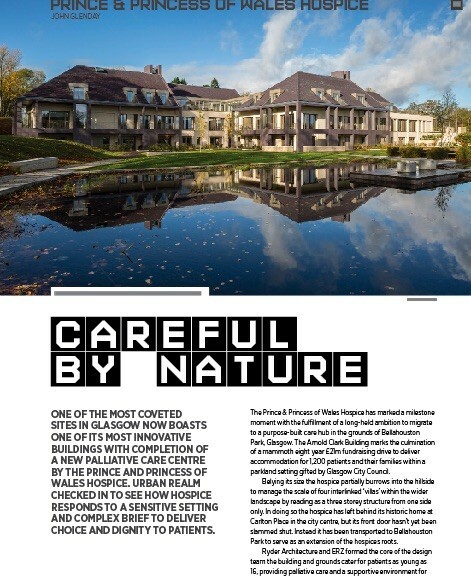 The hospice has certainly gained a wealth of facilities, in addition to space and light but In moving from the city centre has anything been lost? Forbes said: “Language is important, we always refer to people, patients, staff and volunteers. A big concern right from the outset was how you take the good parts and the atmosphere from Carlton Place? A lot of it is down to the people but there are also borrowed references that have found there way into the building, the front door being the most obvious.” Other references to the Georgian terrace can be found in the many alcoves and niches and even the front gates, the pattern for which is referenced from the South Portland Street Suspension Bridge. Forbes continued: “The notion of an alcove was really important in Glasgow town houses so you find those dotted around. There’s always a place to take a rest and there’s always a scalloped edge which marks those alcoves out. There’s always a choice for people when deciding where they want to go. Forbes added: “There are just three materials, the first is Penrhyn slate, that came out of the requirement that we have a traditional slate roof. Having traditional slate there would have been very black and that wasn’t a reference we wanted to make so we found this heather coloured Welsh slate which has a fantastic relationship with what Rolf was doing with the colours in the landscape. Vital but intimidating infrastructure such as medical points have been sensitively incorporated within fixed pieces of joinery, helping to afford dignity to hospice users with Burns Design overseeing all interiors, including soft furnishing, to further imbue the hospice with a domestic character. The concept of wellness is immediately apparent to everyone but it is rather hard to define in practice. 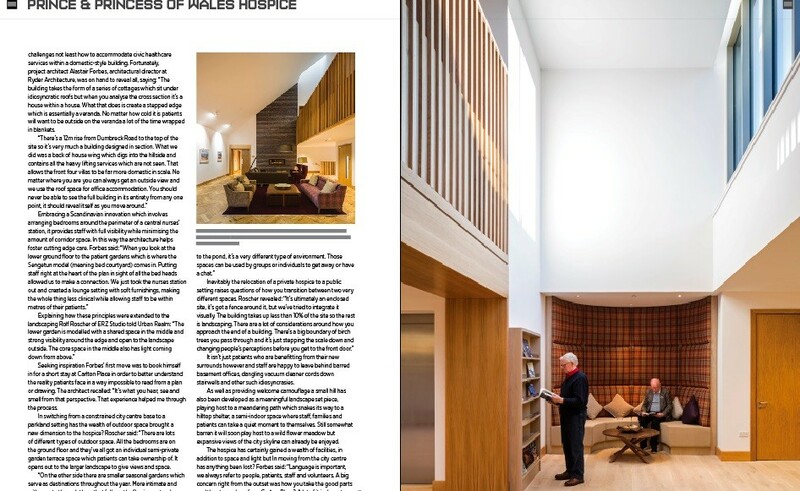 The Prince and Princess of Wales Hospice this elusive concept and bottled it within the villas and parkland of Bellahouston, with a hospice infrastructure that can finally provide care and attention equal to that given by its dedicated staff. Donations to The Prince & Princess of Wales Hospice are invited by supporting the ‘A Little Less Strictly’ dance floor charity event.